Every three hours, someone dies in a home fire somewhere in the United States, according to the The National Fire Protection Association. The NFPA recommends one ladder in every occupied room on floors above the main level. The Kidde Escape Ladder provides a means of escape from a fire if you live in a two or three story home. 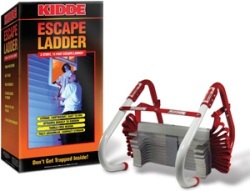 The Kidde Escape Ladder stores easily under the bed or near a window, and is quick and easy to use. • Ladder Tested to 1000 lbs.